Double Paralympic champion Eleanor Simmonds was one of five British gold medallists in the opening day of the IPC European Championships in Berlin. 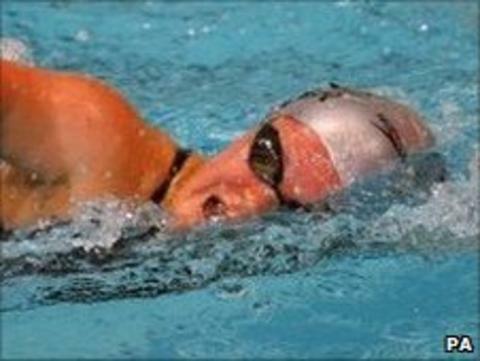 She beat her own world record to win S6 400m freestyle gold, while Susannah Rodgers set a European record in the S7 400m freestyle. World champion Jonathan Fox set a new world record on his way to winning the S7 500m freestyle gold. Rhiannon Henry and Heather Frederiksen also took home golds. Henry secured a British record as she won the women's SM13 200m individual medley. Frederiksen returned to the international scene with a powerful swim in the women's S8 100m backstroke. Simmonds had her teammates on their feet as she broke her own world record by two seconds - and 17 seconds ahead of the pack - with a time of 5:25.20. "I just went for it in that final and I am so happy to get the record," she said. This will be a good boost to team confidence as the meet progresses. "It was such a hard swim and at 200m it was tough. 400m seems so long but when you finish and you win the feeling makes it worthwhile." Fellow Brit Natalie Jones grabbed bronze in the same race. Fox wowed the crowd with an expertly timed heat swim of 4:47.16. In the final, he pipped Croatia's former world record holder Mihovil Spanja to the finish line. "I came here to get gold and it is great to have done that," Fox said. "I might have gone out a bit strong but I think that the time was good. I got the record this morning and I knew I had that in me." As well as the five gold medals, British competitors took home nine silvers. National performance director John Atkinson said: "Five gold medals from five different athletes is a pleasing start to the competition. "We had 14 medallists in total and all of those medals went to different swimmers so the majority of our team will be going home with a medal around their necks. "This will be a good boost to team confidence as the meet progresses." The championships run until the 11 July.